Even though it may be a chilly 50 degrees for our Christmas season, we still do celebrate Christmas in the Sunshine State. When I first moved to South Florida it was hard to get into the Christmas spirit with no snow and decorated palm trees. However, the longer I live down here, the more I appreciate the mild temps and truly think its perfectly normal to decorate in your shorts and flip-flops. Plus, there are not too many places up north that you can have a Christmas swim in your pool complete with a mimosa made with your own fresh squeezed orange juice! So, here’s to celebrating the holiday season, Florida style! North Pole Express: Florida Rail Road Museum, 12210 83rd St East, Parrish, FL Dates: November 29 & 30, December 1, 2, 6, 7, 8, 9, 13, 14, 15, 16, 17,. http://www.frrm.org/Months/december.html. Prices vary depending upon time and seat selection. Ride the train to the North Pole and see Santa! This is a fun way for children and adults to ride a train! See Santa, beautifully decorated trees, make take-home treats for the reindeer visiting your home! The train will not leave until all the children have had a chance to visit with Santa. Get into the holiday spirit here! Get there early, boarding begins 30 minutes prior to departure. Holiday Lights at St. Armands Circle: December 7st: 5:30 PM-9 PM: St. Armands kicks off the holiday with beautiful streets decorated for Christmas. Starting at 5:30 PM will be a special performance. Join in the annual Christmas Carol sing-along at 6 PM followed by a visit by Santa in his sleigh. Then things start to light up! The Christmas tree lighting for the circle will take place. Photos with Santa are available from 6:30 PM-8 PM. The area stores will have special promotions too. If you want to dine at one of the great restaurants after the festivities, it is recommended that you make reservations. Candy Cane Scavenger Hunt: December 1st. The Children’s Garden 1670 10th Way, Sarasota, Fl. 34236, 941.330.1711: Gates Open at 9:45 AM. Gnomes, fairies, and elves will be hiding sweet treats in sections of the garden for children to find. Once the candy is found, the hunt will be over but the fun will continue. A Holiday coloring station will be set up for so children can write letters to Santa. Baked good with be available as well as hot chocolate and fresh coffee for purchase. Singing Christmas Tree: First Baptist Church of Sarasota, 1661 Main Street (downtown), Sarasota. December 2nd, 5th, 8th and 9th. Times differ. See Link to price & time https://firstsarasota.brushfire.com/singing-christmas-tree. First Baptist Church of Sarasota celebrates the season with its 45th annual singing Christmas Tree. See the 25-foot festive singing tree and performances signing your favorite holiday music. The members of the First Baptist Church along with hundreds of volunteers make this special day possible every year. If you haven’t attended yet, you will not want to miss this year! Holiday Splendor at The Ringling, 5401 Bay Shore Road, Sarasota: December 6th 5 PM-8 PM: Enjoy Christmas for a cause! Free admission when you bring an unwrapped toy for Toy for Tots and extended hours-until 8 PM. Enjoy music from local schools and holiday performances. You can tour the first floor of the Ca’ d’Zan and all the venues the museum has to offer. Santa Christmas Glow Run 5K: December 8th 6 PM: Nathan Benderson Park, 851 Nathan Benderson Cir, Sarasota. 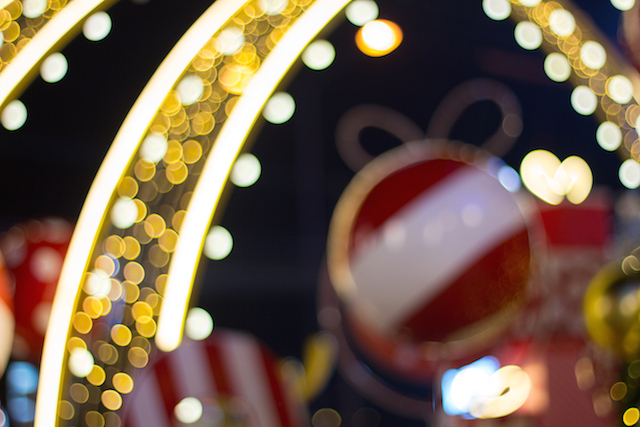 Can you imagine running in a beautiful park with thousands of lights and holiday characters? This family-friendly run walk is truly a fun way to kick off the holiday season. Just another reason to have that extra Christmas cookie! Run through Christmas decorations, listen to holiday music as you make your way through the timed run. Thousands of lights illuminate through the park to give you a great nighttime fun run or walk. A Night Before Christmas at GT Bray Park: December 15th 10 AM-2 PM. 5502 33rd Avenue Drive West, Bradenton, FL 34209. Cost $5 for Activity Wristbands. Santa will be visiting Bray Park just in time for Christmas. Spend some time hanging out with Santa, participate in face painting bounce house or take a holiday hayride. This is marked for fun! Breakfast with Santa is a holiday tradition that children remember. If you are looking for places to have breakfast with Santa in the Sarasota area, there are a few to choose from. If you are looking for something casual or a place to get dressed up, you will find it here. 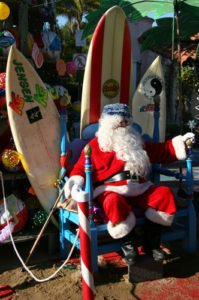 Breakfast with Santa and Mrs. Claus, Old Salty Dog, City Island Location,1601 B Ken Thompson Pkwy, Sarasota 941-388-4311. December 2nd, 8:30AM-11:30 AM: Pictures will be taken with Santa & Mrs. Claus. This is going to be a fun time! Take a ride in a horse-drawn carriage, children can make reindeer food, enjoy the hot chocolate bar and more! A collection will be taken for donations for Nate’s Honor Animal Rescue. Breakfast with Santa, December 9th: 9AM-11AM: Ed’s Tavern–10719 Rodeo Dr, Lakewood Ranch. 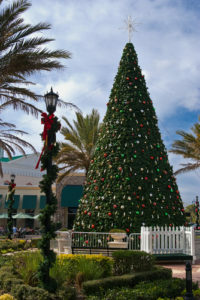 Visit Lakewood Ranch, the downtown area will be decorated for the holidays with their large Christmas tree center stage. To reserve your spot, please call 941-907-0400. 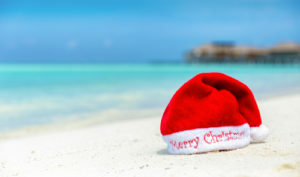 Breakfast on the Bay with Santa: Ritz Carlton, December 16th, 9 AM-12 PM. $59 per adult, $39 for children under 12, children under 3 free. Breakfast will be served outside the hotel beside the bay. Treat yourself and your loved ones a breakfast buffet in our warm weather with a fantastic view. Children’s activities will not only include a visit with Santa but face painting, balloon art, cookie decorating and more. Feast your eyes as well as your stomach with a trip to the Ritz. Special event. Reservations are required and can be made by contacting the resort at (941) 309-2000. Music on Main: December 1st, 6 PM-9 PM. This month’s music on main will also kick off the holiday season in Lakewood Ranch. Not only will there be great music, but Santa Strolls too! Bring your lawn chairs, blankets and sit back and relax to live music on the ranch. The streets are lined with food vendors, beer trucks, and sponsor booths. Carriage Ride, Carolers, Strolling Santa: December 7th, 6:30PM-8:30 PM: Lakewood Ranch comes to life with the holiday spirit every Thursday evening of the month of December to celebrate this special season. Listen to your favorite Christmas carols, visit with Santa, or take a ride through Lakewood Ranch. Say hi to Santa as he walks and visits with guests around downtown Lakewood Ranch. Holidays Around the Ranch: December 14th, 6PM-9PM Downtown Lakewood Ranch: Santa makes his grand entry on this special night! His magnificent horse-drawn carriage will be decorated with lights and garland. Carolers will lead the way to the lighting of the Christmas tree. Children can skate to music and participate in many activities. Live performances from area dance studios and more! Come out, grab some eggnog and get into the holiday spirit at Lakewood Ranch. Lunch with Santa, December 8th: 12PM-3PM-MacAllisters Grill & Tavern. To reserve your spot, please call 941-359-2424. Breakfast with Santa, December 10th: 9AM-11AM: Ed’s Tavern. To reserve your spot, please call 941-907-0400. Special Christmas Celebration: December 23rd, 6PM-8:30 PM: Downtown Lakewood Ranch. Join Grace Community Church for this special Christmas celebration in downtown Lakewood Ranch. This fun Christmas festival and candlelight service will have Santa, games, rides and more! 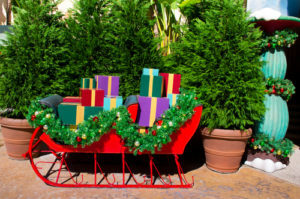 Visit with Santa in Lakewood Ranch and give him your last minute Christmas wish list. Wrap up your holiday season with Grace Community Church. Looking for some adult fun to celebrate the holiday season? What better way than to gather a few of your friends and check out these ideas. 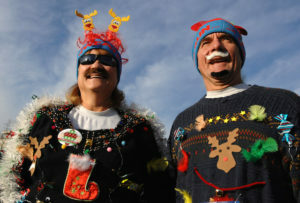 I personally love the ugly sweater crawl. But, hanging out in the beer garden at JDub’s doesn’t sound too painful. Ugly Sweater Bar Crawl, December 8th, 5PM-12AM, Tickets are $20-$30 PP and are selling out fast! Click Here to Buy Tickets https://www.eventbrite.com/e/ugly-sweater-bar-crawl-sarasota-tickets-35696088963?aff=941area#tickets. Do you have an ugly Christmas sweater you just can’t get enough of? Maybe matching pants to go with the sweater? Well, you are in luck! Wear your outfit that nobody can stand to this pub crawl throughout downtown Sarasota. Tickets include the following: Signature Ugly Sweater themed Koozie and Sunglasses Registration party to kick off the crawl. Exclusive Drink and Food specials at participating bars. Ugly Sweater Bar Crawl Lanyard for bar and giveaway access. Holiday music rocking at each participating bar. Hundreds of crawlers dressed in the ugliest holiday gear. This Christmas, Ugly is Good! National Lampoon’s Christmas Vacation in the Beer Garden: December 14th, 7PM-9PM, JDub’s Brewing Company: 1215 Mango Ave, Sarasota. Watch this classic and have a good laugh with a good beer. You can bring a blanket or lawn chairs and watch this funny movie on JDub’s 12 ft movie screen. The beer garden tables are also available to use as well. 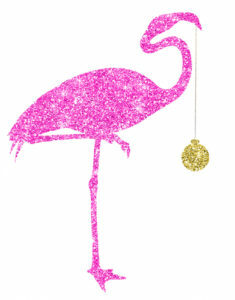 Siesta Key Rum-Annual Barrel Tree Lighting, December 8th 6PM-8PM, 2212 Industrial Blvd, Sarasota. Enjoy sampling holiday drinks made with rum and help a good cause too. A $15 donation per person will be collected to raise money for Toys for Tots. There will be a variety of rums to try and even take home for a holiday gift. This is the 6th year for this event and they are just getting warmed up! Art Walk Weekend, Village of the Arts, 1113 12th St West, Bradenton. December 7th-8th, December 7th 6PM-9:30 PM. Saturday, December 8nd 11AM-4PM. Check out the Village Wonderland this holiday season. 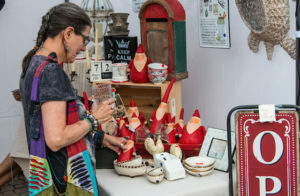 Although this isn’t a true Christmas craft fair, the artists in the Village of the Arts will be making special items for this holiday season. Over 20 artists and specialty shops will be open. The village will be decorated for the holidays and it will be so nice to walk the shops and get into the holiday mood. Sarasota Craft Show Robarts Sports Arena, 3000 Ringling Blvd, November 30th-December 2nd, 9AM-6PM: See over 100 top US artists and their work displayed for purchase. This is the 7th year for this event and with it brings a variety of artwork for purchase. Atomic Holiday Bazaar: December 8th and 9th Noon-5PM, Sarasota Municipal Auditorium 801 N Tamiami Trail, Sarasota. This is the 13th year for the popular Indie artists to display and sell affordable, quality handmade art and crafts. This is more than just an art fair, it is a street fair, filled with vendors and food trucks. Not only will you find one of a kind gift but have fun doing it! Lido Beach Holiday of the Arts, 400 Benjamin Franklin Drive: December 9th-10th, 10AM-5PM: This is the 2nd annual event with a collection of over 80 artists, local as well as throughout the US. Original work, sculptures, clay art, jewelry, fine art, photography and mixed media. Varying price points. Pick something up for yourself or someone special. Admission is free. Lights in Bloom: Selby Gardens: December 20th-January 6th, 6PM-9PM. Tickets $25 nonmember adults, Children $7. Over 1 million lights will illuminate the gardens and pathways leading you through the wonders of Selby gardens. Stroll through the beautiful lit flowers, radiant rainforest butterflies and more. Every night, Santa and his elves will make his appearance and visit with the children (before Christmas Eve). Children art & crafts and other activities will be offered plus live entertainment. Grilled food items will be available and The Selby House Cafe will also be open. Lakewood Ranch: Downtown Lakewood Ranch is decorated for the holiday season. The large Christmas Tree is brightly lit, the streets will be decorated and shops will be open with extended hours. Dine outside in the cool evenings and listen to holiday music throughout the commercial area. Lakewood Ranch has unique shops if you are looking for something special, including your pet. Venice Boat Parade: December 1st, 6PM-9PM: The parade starts just north of Albee Ridge Road and goes down the Intracoastal Waterway and Venetian Waterway Trail. No boat is too small to be considered. So, come and have some fun with fellow skippers! There are several areas for public viewing. You can bring your lawn chairs or if you prefer, secure a seat with one of the waterside restaurants. Manatee River Holiday Boat Parade: December 8th 6:30 PM-9 PM: See the themed holiday decorated boats as they parade through the river. These boats compete to win prizes so get ready for some fun on the water. Several restaurants along the parade route will have specials, buffet dinners to help kick off the holiday season during the boat parade. The parade will start at Snead Island, and go through Bradenton Yacht Club, Riverhouse Regatta Pointe, Green Bridge Pier, and end at Pier 22. 1st place price is $750 this year. Sarasota Boat Parade: December 8th at 6 PM. The Sarasota Boat Parade celebrates Christmas with the 33rd Annual Sarasota Holiday Boat Parade of Lights. The best areas for viewing are Marina Jack Restaurant, Bayfront Park, City Island, and Centennial Park. Bring chairs & coolers and enjoy the spectral array of boats decorated and some will be playing Christmas music. The parade lasts about 1 hour. Come early and find your seat. December 1st in downtown Sarasota will be filled with excitement as the 23rd annual Sarasota Holiday Parade begins! The parade will start at 7 PM. The parade route is from 301/Washington Street to Gulfstream Ave. See decorated floats, hear your favorite holiday music and kick off the holiday season with the guest of honor, Santa Clause! If you are looking for a great restaurant to have a Christmas Dinner or Christmas Buffet in Sarasota, you are in luck this holiday season. Several local eateries will be open and serving a special menu. Because this is a major holiday and many restaurants will be closed, it would be wise to secure a reservation. Lido Beach Beach Resort, 700 Benjamin Franklin Drive, Sarasota. 941-388-2161. 11:00 AM-4 PM. Adults $52.95, Children 12 & Under $24.95. Imagine dining with a view of the Gulf of Mexico and the Sarasota skyline for Christmas. Lido Beach Resort will be serving a Christmas buffet complete with a limitless raw bar, freshly baked bread and specialty cheese, a carving station, and delightful desserts. I just received their buffet menu for Christmas 2018 and you will want to come hungry! The Lido Beach Resort has something special planned for this Christmas Buffet. Just to give you a taste of what they have to offer, how about a carving station with Prime Rib, or Honey Lavender Chicken? They will also have a chilled seafood station and a full dessert section. Wow! Old Hamburg Schnitzelhaus, 3246 East Bay Drive, Holmes Beach (Anna Maria Island), 941-778-1320. Open Christmas Eve and Christmas Day. Hours for Christmas Eve 5 PM-9 or 10 PM, Christmas Day special hours and menu. Call to make reservations. At this writing, the menu for 2018 Christmas Day was not published on their website. This is one of my favorite places. Most of the time, one if not both owners will be in the restaurant. They are welcoming and always go out of their way to make you feel special. If you are nearby Anna Maria Island for Christmas, check this place out. Ritz Carlton, 1111 Ritz Carlton Drive, Sarasota. 941-309-2000. 11 AM-4 PM Adults $124, Children $42. A special Christmas Brunch Buffet will be served in the Grand Ballroom. The Ritz’s Ballroom will be beautifully decorated for this special occasion. 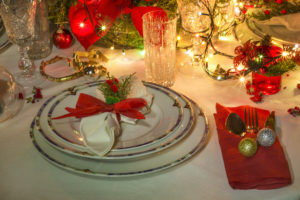 The chef will prepare a delicious spread of holiday favorites complete with specialty desserts. Reservations are Required for this event. The Ritz Carlton also has a more casual dining offering in their Jack Dusty restaurant. Reservations are also required. Euphemia Haye, 5540 Gulf of Mexico Dr, Longboat Key, 941-383-3633. 2 PM-9 PM. The special for Christmas Dinner will be Chef Ray’s Bavarian-Style Roast Goose dinner – Sliced roasted goose with giblet gravy served with a German potato dumpling and sweet & sour red cabbage. There will be an a la carte menu and daily specials too. The restaurant will be open Christmas Eve and Christmas Day. The Loft will be open with live music on Christmas Eve starting at 6 PM. Yummy House China Bistro, 1737 S. Tamiami Trail, 941-351-1688. Even on a normal day/evening, you should make a reservation to eat here. I always think of the movie The Christmas Story when I think of a Chinese restaurant open on Christmas Day! I love Yummy House, they serve large portions, like family style. The menu is big and I always have a hard time deciding on what to order. Hopefully, you will have leftovers. They do serve alcohol so you can have a good drink with dinner. Madison’s Avenue Cafe & Deli, St. Armands Circle, 28 Boulevard of the Presidents, Sarasota. Open Christmas Day 8 AM-2 PM. Madison’s is a casual eatery serving breakfast and lunch. They do have a nice bakery selection as well. Christmas in Sarasota can be filled with fun, good memories with friends and family. Whether you are a visitor or a resident, you will find a holiday spirit and joy in Sarasota. Merry Christmas!